View Talay Pattaya - A name that everyone in Pattaya is familiar with is in a central location in Jomtien about 5 minutes to south Pattaya. 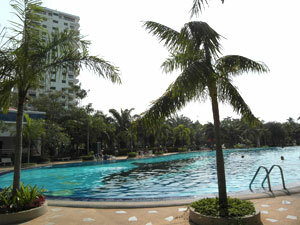 View Talay 2 consists of 2 buildings (A and B) with large communal swimming pools. What makes the View Talay such a popular condominium complex is not just its central location but also the convenience of shopping on the ground floor. Catch a Baht bus for 10 baht day and night from Thappraya Road to go to Jomtien beach road or south Pattaya. 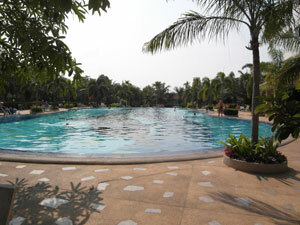 This is a nice central location close to Jomtien & Dongtan Beach and a short ride to Pattaya & its nightlife. 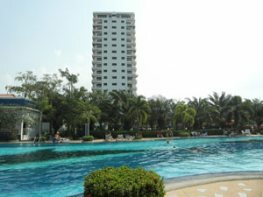 From here, depending on what floor you live, you also overlook the Pattaya water park and tower and have a nice ocean view. Click here for a Google location Map of View Talay 2. Opens in a new window. 1 Bedroom: Features large kitchen which is fully fitted out, TV & DVD in living room, fully furnished, air cons, and beautiful sea view. Rent: 25,000 - 38,000 Baht per month. Depending on season and length of stay. Features: feature ceilings with concealed lighting, kitchen fully kitted out, air-conditioned with ceiling fans, washing machine & fully furnished. Rent: 15,000 - 24,000 Baht per month. Depending on season and length of stay. Features: Full kitchen, air-con & ceiling fan, TV & DVD, bar, fully furnished. Rent: 15,000 - 24,000 Baht. Depending on season and length of stay. Studio: Air con & ceiling fan, flat screen LCD, kitchen fully kitted out, fully furnished, sea view, and rural view. 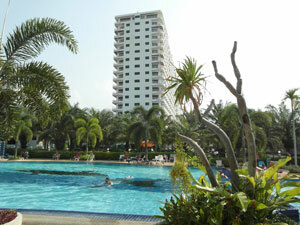 38 sq m.
Rent: 16,000 - 25,000 Baht. Depending on season and length of stay.